The image depicts on the right a group of seven uniformed soldiers who, on the signal of an officer, fire into a crowd of civilians at left, with three shown lying bleeding on the ground. The body lying on the ground nearest to the British soldiers is that of Crispus Attucks--a fugitive slave of mixed race whom Revere depicts as a white man. Two others who were injured are shown carried by the crowd. In the foreground is a dog; in the background are a row of houses, the First Church, and the Town House. Behind the British troops is another row of buildings including the Royal Custom House, which bears the sign "Butcher's Hall" (apparently a bit of editorial license by Revere). Beneath the print are 18 lines of verse, which begin: "Unhappy Boston! see thy Sons deplore, Thy hallowed Walks besmeared with guiltless Gore." Also listed are the "unhappy Sufferers" Saml Gray, Saml Maverick, James Caldwell, Crispus Attucks, and Patrick Carr (killed) and it is noted that there were "Six wounded; two of them (Christr Monk & John Clark) Mortally." 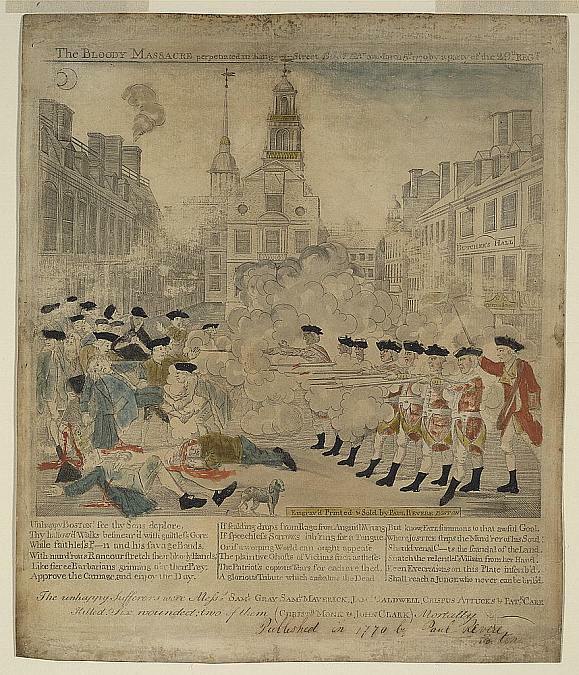 Later to become known as "The Boston Massacre," the scene on March 3, 1770 depicted in this print was copied by Paul Revere, a skilled silversmith and engraver, from a drawing by Henry Pelham which Pelham apparently had shown to Revere. Without Pelham's permission, Revere rushed to get his own version of the drawing colorized and printed, and it was released a little more than three weeks after the shooting on or about March 28 under the title "The Bloody Massacre perpetrated in King Street, Boston on March 5th 1770 by a party of the 29th Regiment". After Revere's print had been widely circulated and Pelham wrote to Revere angrily complaining about the use of his drawing, Pelham published his own very similar engraving under the title "The Fruits of Arbitrary Power, or the Bloody Massacre." By most accounts, the illustration is an inaccurate, sensationalized portrayal of the skirmish intended to inflame colonial passions against the Crown. Tensions in Boston had increased after after British troops had arrived in 1768 to help the Royal governor and customs officials enforce collection of tariffs imposed on imported goods under the unpopular Townshend Acts enacted by Parliament. The actual incident involved a crowd of about sixty civilians who had gathered after a young wigmaker's apprentice insulted a British officer outside the Custom House, claiming that the officer had failed to pay a bill due to the boy's master (a bill which in fact had been settled). Although the officer ignored the insult, a soldier on sentry duty told the boy that he should show more respect to the officer, left his post and, after an angry exchange of words, struck the boy on the side of the head with his musket, leaving him bruised. A crowd soon gathered and additional soldiers were called, with the civilians taunting and throwing rocks and snowballs at the British soldiers, as well as daring them to "fire!". At some point in the confrontation, someone did shout "fire" and, apparently without any officer's order, a soldier's gun discharged, which was quickly followed by shots from other soldiers. Three colonials were shot dead and another eight were wounded, two of whom later died. The trial of the eight soldiers opened on November 27, 1770, at which their attorneys included John Adams, a leading Boston lawyer and colonial activist who would later succeed George Washington as president. Adams argued that if the soldiers were endangered by the mob, which he called "a motley rabble of saucy boys, negroes, and molattoes, Irish teagues and outlandish jack tarrs [i.e. sailors]", they had the legal right to defend themselves and should be acquitted or were at most guilty of manslaughter. The jury agreed with Adams and acquitted six of the soldiers, with another two convicted of manslaughter because of evidence that they had fired directly into the crowd. The two who were found guilty escaped execution after they "prayed the benefit of clergy," a Medieval remnant which spared those who could demonstrate that they could read or recite or read Psalm 51, verse 1, the "neck verse," at a time when most people were illiterate. The Suffolk County Sheriff branded Kilroy and Montgomery on the right thumb with an "M" for murder. The brand was to prevent them from ever being able to invoke the benefit of clergy again. The Part I took in Defence of Cptn. Preston and the Soldiers, procured me Anxiety, and Obloquy enough. It was, however, one of the most gallant, generous, manly and disinterested Actions of my whole Life, and one of the best Pieces of Service I ever rendered my Country. Judgment of Death against those Soldiers would have been as foul a Stain upon this Country as the Executions of the Quakers or Witches anciently. As the Evidence was, the Verdict of the Jury was exactly right.